I have tried several times to connect to an xfinitywifi hotspot and each time to no avail. We have one here on our own gateway and cannot even connect to that one as a test case. I can direct my android device to connect to the xfinitywifi SSID just fine and it does so. Launching the browser never redirects to a sign in page and all web pages are just not available. I have tried manually going to https:\\wifi.comcast.com , that just gives useless information about comcast wifi. Tried manually going to https://comcast.optimumwifi.com and it never connects. How do I sign in and use xfinitywifi hotspots? Comcast XFINITY Internet subscribers log in with their @Comcast.net email user name and password. Comcast Business Internet subscribers log in with their @comcastbiz.net email usesrname and password -or- @yourdomain.com (hosted by Comcast) email username and password associated with their Comcast Business Account. 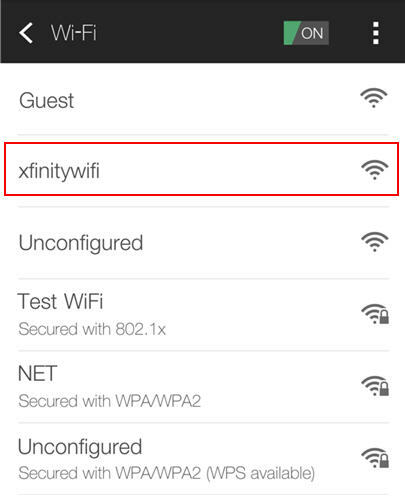 Connect to the xfinitywifi or XFINITY network by accessing the WiFi settings on your device. 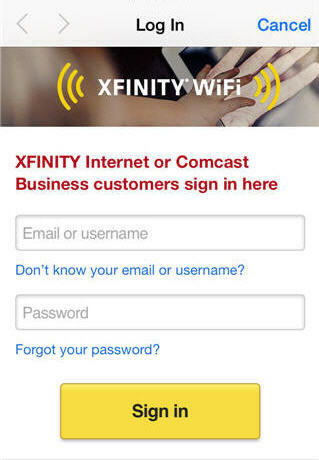 Launch your web browser to be taken to the XFINITY® WiFi sign-in page. If you don't see the sign-in page, enter a different URL, like http://business.comcast.com, in your browser to be redirected to our sign-in page. Enter your Comcast Business email address and password, then select Sign in. You will be directed to the Comcast Business website and from there you can begin to browse the Internet. Manual connection to the secure XFINITY SSID is supported, or you can complete a one-time configuration of your device to add a secure profile. Once you load the secure profile onto your device, it will automatically authenticate and connect to the secure SSID. Downloading the secure profile is required to connect to the XFINITY SSID automatically, but is optional for the xfinitywifi SSID. While connected to the Internet, download the latest version of the XFINITY® WiFi app from the Apple App store or the Google Play store. Sign in to the app using your primary or secondary username and password. If you're using an Android device, the app manages the connection to secure XFINITY® WiFi for you, and you will now connect automatically to secure XFINITY® WiFi whenever you are in range. – Stop here for Android. iOS users, following sign in, you will be prompted to install a secure profile. Follow the prompts to complete installation of the secure profile on your device and return to the XFINITY® WiFi app after installation is complete. The iOS device will now automatically connect to XFINITY® WiFi securely whenever you are in range. – Stop here for iOS. Mac OS X users will need to configure their device using the web-based provisioning flow. These instructions will also work on iOS devices for users that do not wish to download the XFINITY® WiFi app. Downloading the secure profile is required to connect to the XFINITY SSID, but is optional for the xfinitywifi SSID. While connected to the Internet, use a web browser to go to the XFINITY® WiFi microsite located at http://www.xfinity.com/wifi and scroll to the section about secure XFINITY® WiFi. From there, click on the link for Apple OS X and iOS devices to initiate the secure profile installation. You will be prompted to sign in with your primary or secondary username and password. Follow the prompts to complete installation. Your device will automatically connect to XFINITY® WiFi securely whenever you are in range. There is no enhanced security support for Windows at this time, but Windows will be supported later in 2016. Automatic sign-in identifies devices that successfully signed in to the XFINITY® WiFi service previously and allows these devices to connect to the network without signing in again. Your device will automatically authenticate and connect to secure XFINITY® WiFi if you are using the XFINITY® WiFi app or installed the secure profile. If you change your account password, your secure profile will need to be re-installed. If you are not an XFINITY® Internet customer. If you are using a pre-activated XFINITY® username. Once your account is fully active, you will be able to use automatic sign-In. To use XFINITY® WiFi and automatic sign-in on multiple devices, you will have to sign in and register each device individually. In order to access the most up-to-date security features, install the secure XFINITY® WiFi profile on each device. XFINITY® WiFi will disconnect you from the network after you have left the hotspot (typically after five minutes), or after a prolonged period of inactivity. Your device will be registered for automatic sign-in after successfully signing in to a hotspot. You will not be required to provide your XFINITY® username and password to connect to the XFINITY® WiFi network using the same device. These measures are designed for your security and to ensure a better WiFi experience. Your device will automatically authenticate and connect to secure XFINITY® WiFi hotspots if you are using the XFINITY® WiFi app or if you provisioned your device for secure XFINITY® WiFi access. If you change the password for the account, you will have to sign in again in the XFINITY® WiFi app, or will have to re-install the secure profile at http://www.xfinity.com/wifi. If the SSID XFINITY is not in the list of available WiFi networks on the device, you are probably not at a location that supports secure connections to XFINITY® WiFi. Secure XFINITY® WiFi is being rolled out in phases from July 2015 through 2017. If you are unable to see the SSID xfinitywifi you are probably not in range of any XFINITY® WiFi hotspot. Check the hotspot location map at http://www.xfinity.com/wifi or using the XFINITY® WiFi app for iOS and Android. If you are using the XFINITY® WiFi app and are unable to connect to secure XFINITY® WiFi, select the option “Sign in as a different user” in the app settings menu to re-configure your device for Secure XFINITY® WiFi access. If you are connected to the secure SSID XFINITY and still cannot get online, it is possible that we are having a service issue. Please contact us. This Link provides additional information on connecting to xfinitywifi hotspot. I've never tried to do it from android but I have no problems with windows 7 and Internet Explorer 11 and I've connected to several of these hotspots - all of which I'm 100% positive their owners are completely unaware exist. When the http call to ncsi happens, the wifi hotspot intercepts that and returns some magic - I don't know what - that causes Windows to popup the message "you may be required to do further authentication" then it throws up the website for the Comcast login authentication. That URL may change, so I don't think there's any point in trying to bookmark it. Once you login then the wifi hotspot allows you to start doing your thing. There have been MANY reports of antivirus software interfering with the http call to ncsi. And unless the wifi hotspot sees that, it isn't going to open up. Try connecting again with antivirus uninstalled and see if it works. I understand what username and password to use, the problem is that when I connect to an xfinitywifi hotspot, and then open the browser, it is NOT directed to a signin page. Just get a no network connection when trying a page. I need the url for the signin page so I can enter it manually. Or fix the redirect so it works in current versions of android. Any chance I can get an answer to the original question? "What is the URL of the sign in site for xfinitywifi?" Actually it's simpler than that. After connecting to one of these hotspots, open a browser and try accessing a regular NON-HTTPS website that you DO NOT HAVE IN YOUR DNS CACHE. If you have https://www.google.com as your homepage (or any other https: as your homepage) it will fail. Or if you try accessing non-https (like http://www.google.com) which immediately redirects you to the https://www.google.com, then it will fail also. The key is making a DNS query with the web browser to a non-https site that you do not have cached. If you already have the IP address of the site cached - it will fail. The hotspot must get a DNS query for a non-https site from you, it will then return the IP of the magic website that you must login to to turn on the outside access. When your browser attempts to access your page it's redirected to the Comcast login page.